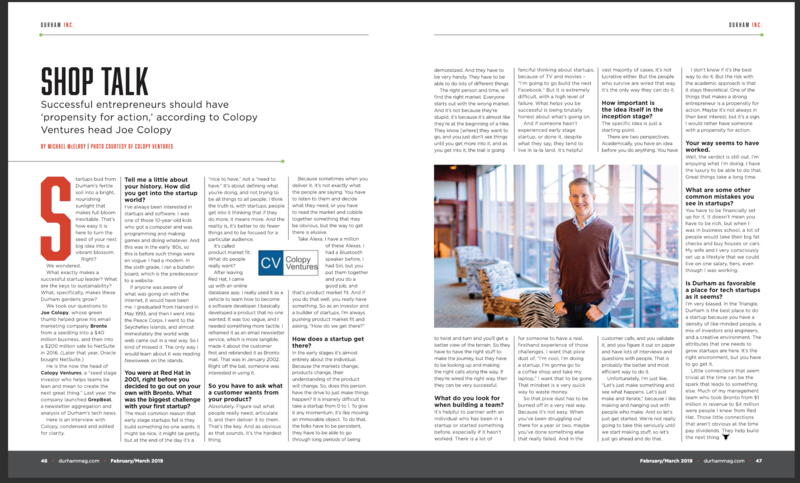 Last month, I was interviewed by Durham Magazine for my views on startups and entrepreneurs. One of my views is that great entrepreneurs have a strong propensity for action. The interview also details quirky stories from my past — like how I majored in Computer Science to avoid writing papers. Pro tip: bad idea! You can read it online or download it for later. Yesterday, I had the pleasure of speaking to a Duke class on Intellectual Property and Innovation: Law, Policy & Entrepreneurship. Thanks Ed for including me! In the early days of Bronto and its predecessor DatabaseApp, we included a terms of service (TOS) page on our websites and on our order forms. This is important! Not only does it build creditability with customers but, many moons later, when hopefully you raise capital or are acquired, you will go through an extensive due diligence process. This process is about minimizing risk for the investor / acquirer. Having a TOS early on shows that you have your ducks in row and lessens the chance of strange claims on your IP from early customers. Your lawyer can simply draft a TOS for you. Or, if you are particularly cheap and scrappy, you can just copy the TOS from one of your larger competitors and change a few words. That’s what we did. Future acquirers and investors want to avoid claims on the IP (and thus their ownership) that crawl out of the woodwork once the big money is announced. Early employees, particularly engineers, are the most likely sources of these claims — someone who could say, “oh yes, that code is partially mine because I borrowed it from the outside.” Be on top of it from the get-go. Have all employees and contractors sign a an agreement BEFORE they start working with you. Investors and acquirers will complete due diligence on your startup prior to completing the deal. For acquisitions, it’s about risk mitigation. The process is extensive. You will have to produce every customer contract and employee agreement from the beginning of time. If you have been around a while like Bronto, this can be difficult. So, be good at record keeping! At Colopy Ventures, like all investors who don’t share your same last name, we require due diligence for our investments. The larger the deal, the more extensive the due diligence. Escrow, as it relates to acquisitions, means the acquirer withholds money from the acquisition for many months or years to settle any odd claims that might pop up. In Bronto’s case, this wasn’t trivial. Twenty-percent of the acquisition price was held for 18 months. Nothing did pop up (whew!) Every acquirer looks at escrows differently. Keep your ducks in a row early on so that you can negotiate escrow terms for as little and as short as possible. Even when you do everything right, large acquisitions still bring out the trolls. We stumbled upon this, too. At the time of acquisition, Sinclair Oil sent us a Cease and Desist letter around use of a Brontosaurus in our logo. They claimed our logo was too similar to theirs. Judge for yourself. Of course, this was ridiculous because there are only so many ways to draw a Brontosaurus and we are in completely different industries. But, anyone can send letter. In the end, their claim went no where. Oracle did hold back escrow of a couple hundred thousands dollars for three years after the acquisition … just in case. 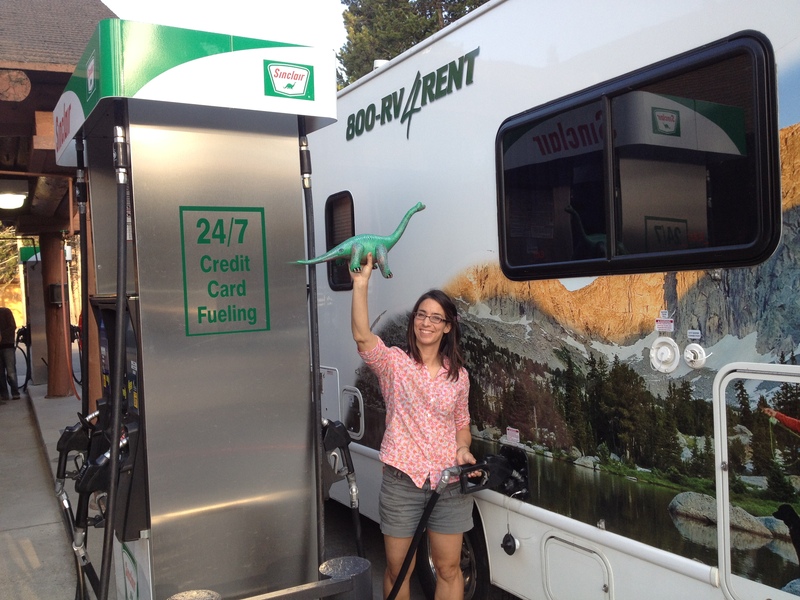 And for Sinclair, they lost a gas-pumping customer for whenever I am RVing out West. Ha! I’m sure that they are still kicking themselves on that one. These are five things to think about as a software entrepreneur. IP applies differently to other industries. Fortunately, IP tends to be less relevant and simpler in the software space. In the end, the success of a software startup is all about execution. YAWA! Yet Another Web Application. Software has clearly moved to the cloud and web applications are the way for software to be delivered. In the late 1990s, SalesForce.com and others were innovators in this new business model: software as a service. Times were good and Bronto jumped on it in the early 2000s. This raises the bar for the entrepreneur. It’s not enough to have a web application with a clear customer. You need to build a sales and marketing machine. And, in the earliest stages of the startup, this means founder hustle. Hustle leads to traction and traction is the best indicator that you can scale sales and marketing later. Well-designed UIs make for nice products but a hustle-first entrepreneur makes for a real business. * YAWA also means another things according to Urban Dictionary. Nothing too inappropriate. We are pleased to welcome back another member into the Colopy Ventures team this summer! Alon Greyber worked here last summer, and will join us again this summer as an engineering intern. Hey, Alon! It’s great to have you here as another intern to work with. I heard that you worked here last summer too. What did you work on then? Last summer I worked with the startup Peoplelove on their web development. Do you know what you’ll be working on this summer? As of now, my main focus will be on the web design of Joe’s project-in-progress, Grepbeat. I may also do more work with Peoplelove, now known as Pugbee. When and how did you learn web design? I starting teaching myself programming in the sixth grade and I’ve stuck with it ever since. I’m now a computer science major at NC State, and I’ve continued to learn more programming languages. So after coming back to work here again, I presume you’re also interested in startups. Have you ever thought of starting your own company? Actually, I have tried to start a few before! In high school, I ran a photobooth business for parties called DreamIt Photos, and I used to sell photography professionally. I also started a programming startup called “SpeakUp” which would help people train for speeches through an automated system. I started it my freshman year of college, but decided to stop working on it once I found out there was already a similar program on the market. Wow, those all sound great! Do you have any other interests beyond your work in programming? Yes! As I’ve mentioned, I’m interested in photography which was the foundation that led me to starting those photography businesses. I’m also passionate about Robotics. Since leaving my high school in Durham, I still go back to help mentor the team there. This all sounds great and I can’t wait to work with you here! Emma Markson is studying business at the University of North Carolina Chapel Hill and a marketing intern at Colopy Ventures. Outside of working with startups, you might see her running around her hometown of Cary or embarking on her next road trip. Hello! My name is Emma and today I had the pleasure of talking to Seguno’s founder, Chris Geiss. Seguno is one of Colopy Ventures’ latest investments. Thanks for taking the time to talk to me about Seguno. To start, what is Seguno? Sure, thanks for having me. I started Seguno last year with my co-founder and high school friend, Marc Baumbach. We build marketing software for retailers to help them drive more revenue while spending less time. Oh, alright, so what inspired you to start Seguno? Having spent 5 years at Bronto Software, I fell in love with the commerce marketing space, and Marc and I became very well versed in this field. We saw an opportunity to bring our knowledge to people who aren’t exactly sure how to get started with marketing. Instead of email being an afterthought, because it can be overwhelming to get started, we want to help merchants really drive revenue through this important channel. I didn’t always know I wanted to be an entrepreneur but I’ve been entrepreneurial since I was a kid, growing up in Syracuse, New York. From selling candy and bracelets in school to being a magician on the weekends, I’ve always enjoyed the process. I really caught the bug in college though and knew software startups were for me. Ever since then, Marc and I have been dabbling with side projects, hackathons, and even started a few companies. That’s great! So, you mentioned earlier how you’d help retailers drive revenue while saving time. How does Seguno allow retailers to do this? Unlike similar solutions, we’re not looking to be the center of our users’ universe. We believe the center of the universe for merchants is their commerce platform so we want to keep it as the one source of truth for their data and fit seamlessly into their everyday workflows. No more context switching or having to learn new tools. We’re also baking in all the sophisticated strategies and best practices we learned from working with some of the best brands in the business so these merchants can really punch above their weight. Oh, so is there any commerce platform you’re starting with first? Focus is important so we have started with Shopify, a multi-channel commerce platform for everyone from solopreneurs to global brands. We chose Shopify because they continue to make real advancements to their platform that are enabling us to bring our vision to life. This wasn’t possible before so it’s great to see it all come together. Do you have any customers yet? What stage is Seguno in? We have a couple apps in the Shopify marketplace right now with over 1,300 customers but the Seguno platform is launching this Summer. We are a mighty, two-man operation so our focus is product fit and growth. After the product feels right and we’ve garnered enough traction, we’ll look to raise another round to expand our team. Is there anything else you’d like to add that anyone reading this should know? I’m always interested in connecting with anyone who is passionate about this space, so please reach out. The more we can help merchants deliver a better experience for their customers, the more we all win. Sounds like you are doing wonderful work and I can’t wait to see you continue on with this. Thanks so much for taking the time to talk to me today. Stay tuned for their launch this summer. If you would like to learn more about Seguno, you can find more information on their website or by visiting them in the Colopy Ventures office. There is math and then there is startup math. For many entrepreneurs this includes evaluating an angel or seed round investment that requires an option pool. The startup is founder held before the round. Let me know what you think. Always looking to improve it. Missions, Strategies and Values … Oh My! I played the scarecrow in my elementary school’s rendition of Wizard of Oz. One of the best parts was when my fellow sixth grade Tin Man, Dorothy and I cantered across the stage as we chanted “Lions, Tigers and Bears … oh my!” Tales of my performance still echo through the hallowed halls of Fairlawn Elementary School. Why am I telling you this? The challenge of scaling a company to the next phase is scary. The first phase is about hustling your way to a real product, stable of customers and small team. But, you have to change your approach to continue growing. The business needs outstrip founder heroics. This is where setting and articulating a broader mission, values and strategy becomes critical — a la Missions, Strategies, and Values … Oh My! At Bronto, we ran into this scaling problem when we were doing $3m in sales. Someone suggested we read Beyond Entrepreneurship by Jim Collins (he also wrote Good to Great and Built to Last). The book is targeted to leaders of successful small businesses who struggle to move past the initial successes. That’s where we were. The crux of the book is to add a vision framework in order to empower your team and scale beyond founder heroics. I was very skeptical of this mumbo jumbo corporate voodoo, at first — but, I am now a believer. It was one of the reasons we were able to grow from $3m to $50m, over the ensuing years. “Repetitio mater studiorum est” is Latin for repetition is the mother of learning. This is true. At Bronto, I started every presentation with the same vision framework slide (the first one below.) Inevitably, the team would moan, like teenagers asked to clean their room for the third time. But, their boredom was great! Everyone deeply understood who we were and what we were trying to accomplish. This emboldened us under a common direction. Our vision framework had four parts — mission, strategy, values and purpose. Values were best described as our corporate personality. We were “transparent, approachable and passionate.” We didn’t draft those words ourselves but rather heard them from our customers. They were genuine — not forced or fabricated. Strategy wasn’t a simple statement, unlike the other parts. It was a catch all for explaining our differentiators, go to market plans, etc. Purpose was the simplest but most fundamental of the four parts. Instead of saying we sell and service our product, we framed things around helping our customers drive more revenue. This re-enforced our customer orientation and was very effective. Our vision framework worked for us. We evolved it around our needs and over time. And, we repeated it — over and over again. Repetition is the mother of learning. Eventually, we found our yellow brick road and our mission, strategies and values drew the map to get us there. P.S., I wrote a similar post about strategy over seven years ago, when we were in the midst of Mission 2. P.P.S., Yes — there is a photograph of me as a sixth grade scarecrow. And, no — you will never see it. Entrepreneurs and investors are on a perpetual quest to have hockey stick growth for their startups. Hockey stick growth happens (hopefully!) after you get product-market fit and start ramping. If growth accelerates, the revenue curve maps to the curve of a hockey stick — smoothly up and to the right. But, in reality, startup growth is never smooth and fraught with bumps and cuts along the way that are often masked by the larger curve. Bronto grew its revenue from zero to fifty million dollars, over fifteen years. See from the graph — the curve is up and to the right. It would seem like smooth sailing but, in reality, it was with continual stream of discouraging setbacks. Think of these setbacks as paper cuts. And, think of the growth of a startup as growth by a thousand paper cuts. Constantly losing customers and employee, even if we were growing overall, was demoralizing. Two steps forward. One step back. We always lost our largest customer. Inevitably, we stretched too far to acquire them and ultimately couldn’t deliver. Although not fun to lose them, this stretching prepared us to handle more customers like them in the future. Every year, we lost 15% of our customers. Customers are hard fought with a lot of hustle. Even if our net revenue for the year exceed 100% (growing the revenue from a subset of the customers), it was still demoralizing to see the others go. Emotion and spirit isn’t mathematical. We lost employees. At the time of acquisition, we had about 250 employees but we had hired 1234 over the years. That means, we had lost almost 1000 employees through the years — employees who we worked hard to hard to recruit and celebrated when they are started. We had a great culture but life changes on the personal and professional front take people different places. Winston Churchill wrote “success consists of going from failure to failure without loss of enthusiasm.” That was the story Bronto. If you dig into any successful entrepreneurial story, you’ll see the same thing: a broad upward curve, strung together by many failures. Startups are hard, even when you are successful. Its growth by a thousand little paper cuts. But, the joy of the small successes along the way make it worth it, especially if you end up building something truly great. TO VC, OR ALT VC? Modern day Shakespeare would be a startup entrepreneur asking the question: “TO VC, or ALT VC?” Raise venture capital or bootstrap? Bootstrapping is a hard but great alternative to raising venture capital (VC). Unfortunately, the media rarely tells the story of the bootstrapping startup. The more commonly told story is of the glories of raising VC. Raising VC makes for a great story but the consequences of those choices, if not thought through, can have very not exciting and sometimes painful consequences for the entrepreneur a few years down the road. Because of hype around funding, many entrepreneurs confuse the formula for startup success as one of raising capital versus one of getting customers and generating revenue. This is akin to highlighting that you are going to run a marathon versus actually running one. The emphasis is erroneously placed on the intent versus the result. Savings. Karalyn are I are savers. We geared up to live our life on one salary (hers!) for a long time. We kept our “burn rate” low and planned for the long game. Habit. I used to be a Peace Corps Volunteer and made $6k/year (outside of housing.) So, I was used to living with little. Cheap. I can be scrappy. I taught myself web programming (LAMP = Linux Apache MySQL PHP/Perl) so I could be self sufficient and create my own product. I didn’t want to become a developer but had to learn these new skills in order to create the product and start the company. Hiring developers was an expensive option that I wasn’t able to afford. On the flip side, I was fortunate because I didn’t have other challenges like heavy student debt (I paid it off beforehand), struggling or dependent family members (parents and siblings stable, no kids yet), and other things that would have made these choices very difficult. Also, many software companies are not capital intensive businesses to start. Biotech or manufacturing stories would be very different. SAS. Cary NC-based analytics company, generating over $3 billion in revenue per year. A forty-year overnight success story! MailChimp. Atlanta-based email marketing powerhouse, doing over $400 million in revenue. Zoho. India-based cloud business app provider, generating over $400 million in revenue. We all started and grew in highly competitive spaces. We all thrived because we could exclusively focus on the customer with a long-term perspective. Why don’t all startups bootstrap? Well, it’s hard. Money helps. And, often the entrepreneur’s life situation prevents them from doing so. Also, many believe that there is a race to market and the window will close. This can be true but I believe that is usually not the case if the entrepreneur aims to build along-term sustainable organization versus a short-term M&A transaction. Other times, the startup truly has a unique business model that needs to be funded differently. Great VC success stories are often like this — Red Hat, Google, … And, sometimes the models don’t always work, like Napster, but still made sense to be VC funded. Focus. Investors can bring many benefits beyond money. But, they also require time and focus — at the expense of your customers and employees. Direction. What do you want to do? Do you want to be high profile and grow faster or would you have more control to shape the destiny of your creation? Either way is fine. Just make the choice deliberately because your financing choice will dictate your path. And, if that direction is inconsistent with your vision, you will lose. VC can make sense. But, it is not the only game in town. Its important to do what makes sense for your business and, most importantly, for you. Also, the required discipline around bootstrapping makes for great businesses. And, great businesses attract incredible employees, customers and even investors. They all want the same thing. In the end, VC or ALT VC depends on what you want to do. Both paths can lead to great businesses but can have very different outcomes for the entrepreneur. To VC, or ALT VC? This is the question. Easy to ask. Hard to answer. Last week, I spoke to a Harvard class on “Stories from the Bronto Journey.” The class was offered as part of the Technology and Entrepreneurship Center at Harvard (TECH) and consisted mainly of undergraduates — almost 200 of them! Excited to see so much enthusiasm for technology and entrepreneurship. Entrepreneurism is often less about the “what” and more about the “how”. Innovation is how you execute and approach the challenges. My entrepreneurial journey was very long and with five stages — the before, the genesis, the grind, the graduation and the after. The grind is long, hard and usually uncelebrated — but it makes all the difference. Graduations (or exits) can be bittersweet. Build your art and someone else will find it as attractive as you. Or see the slides on Slideshare.